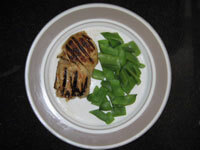 Enjoy these tender and flavorful chicken breasts. In large glass baking dish, whisk together vinegar, mustard, lemon juice and brown sugar. Whisk in Mrs. Dash, white pepper and olive oil. Place chicken breasts in the marinade. Cover and marinate in the refrigerator for 2 to 12 hours. Turn at least once. Drain chicken well; discard marinade. Spray grill or broiler with non-stick spray. Grill or broil about 5 to 8 minutes per side depending on thickness of the breasts. Posted in Recipes. Bookmark the permalink.